Fort Bend Recovers…with Creativity is working to finalize the details for The Harvey Experience. The details for the creative works will be posted soon. But don’t let that stop you from starting to create. 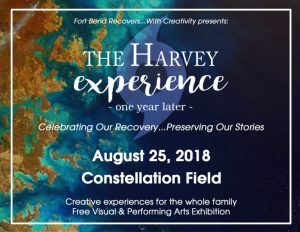 Express your Harvey experience and share your process. We are not looking for the next Mozart or Van Gogh. My high school music and arts teachers are not invited to the event. You are free to express yourself and find your own voice.